Production is completed on the commemorative DVD of the 118th Monon Bell Classic and copies are now available in the Wabash Bookstore Thursday. The DVD includes the entire HDNet telecast of Wabash's 45-7 victory, plus loads of bonus features. 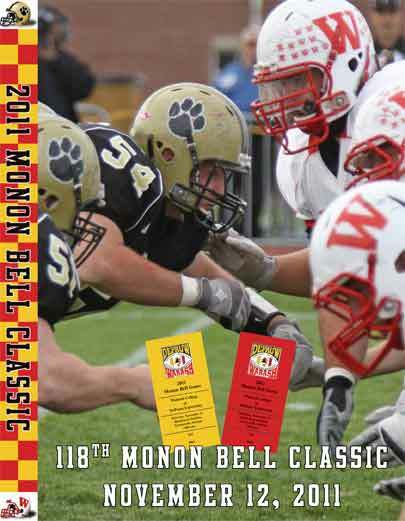 The Bookstore has also received a handful of DVDs from Wabash's historic 47-0 win in the 2010 Monon Bell Classic. The Bookstore will be selling packaged "92-7" two-disc sets while supplies last. Wabash and DePauw have collaborated on the production of the DVDs for more than a decade. Every game from 2000 through present is available, as well as copies of the 1977 and 1994 Bell Games. This year's DVD includes HDNet's telecast (with announcers Kenny Rice and Paul Maguire) and features on Wabash's new athletic facilities, Asian Studies Program, and Wes Chamblee's remarkable comeback from knee surgery. Also included are highlights from Wabash's season, media coverage leading up to the 2011 Monon Bell Classic, photo galleries, and Monon Memories.